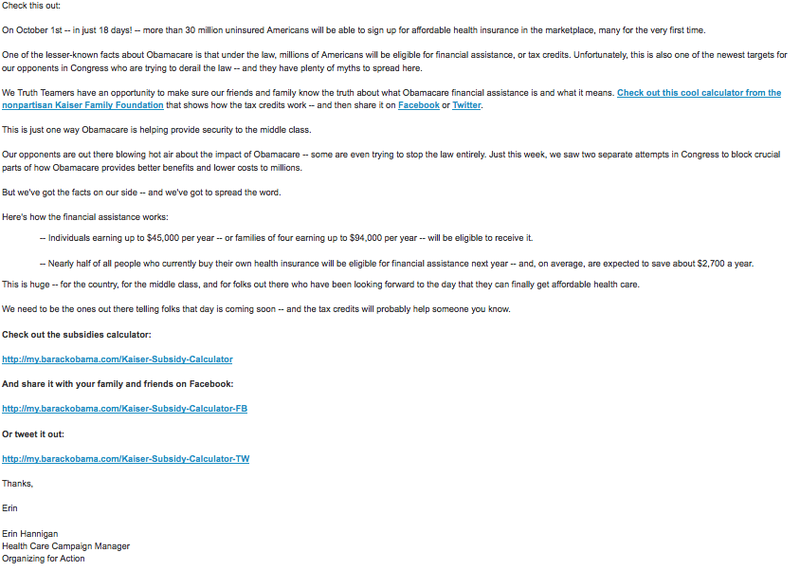 In a September 13 email, Erin Hannigan of Organizing for Action's "Truth Team" bragged about a "cool calculator from the nonpartisan Kaiser Family Foundation" showing how Obamacare's "tax credits" work, and encouraged everyone to "share it on Facebook or Twitter." Obamacare's opponents, especially those who advocate defunding it before it goes live, need to follow Hannigan's suggestion, and even embed it on their websites and blogs. That's because what Kaiser's "cool calculator" really does is expose the statist health care regime's three ugliest financial elements. I covered two of them in my previous PJM column. 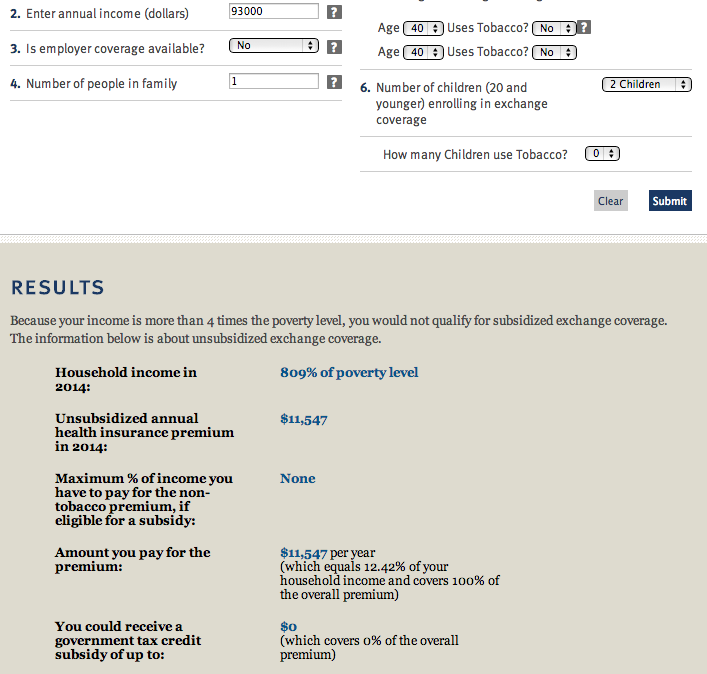 The first is that, when combined with Uncle Sam's current income and payroll tax regimes, the gradual expiration as income increases of Obamacare's "tax credits" — which Kaiser's model schizophrenically describes as "government tax credit subsidies" — will raise the portion of income taken by the government for each additional dollar of earnings to between one-third and one-half, effectively taxing most American workers at marginal rates usually limited to the planet's highest income earners. The second is that its subsidy "cliffs" will cause middle-aged single people and married couples making as little as $45,960 and $62,040, respectively, to lose over $10,000 in subsidies — or "tax credits," in the preferred language of OFA and the U.S. Supreme Court's — when they earn just one additional dollar. These bugs, which jubilant "progressives" as seen above apparently believe are features, will crush incentives to work and to otherwise pursue financial self-improvement. The third tragic outcome of Obamacare is what it will do to marriages and families. In January 2010, two months before Obamacare's passage, the estimable Robert Rector at the Heritage Foundation gave the impact a name: the "wedding tax." What can this couple do? Well, they could decide to earn a few thousand dollars less, which will negate the five-figure premium hit. Encouraging ordinarily willing workers to put in less effort isn't good in any economy, but especially not this one. But if either spouse's earnings are unpredictable or hard to precisely track, they could still "mess up" and get socked with a premium they can't afford. 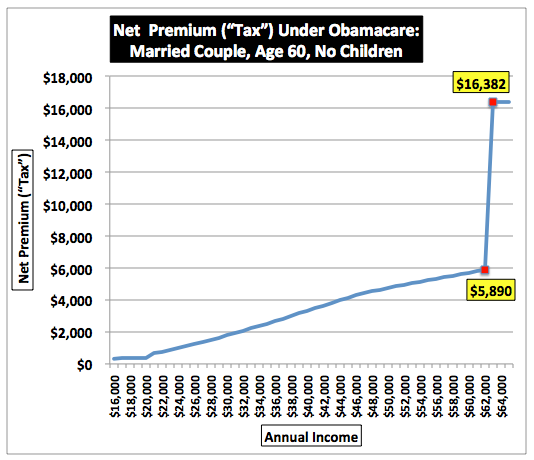 Instead of facing an exorbitant premium increase once their combined earnings hits $62,041 if they were to stay married, each cohabiting adult can earn up to $45,960 before Obamacare's "tax credit"-free premiums kick in. Their annual after-tax savings at age 60 if they shack up and keep their individual earnings between $31,021 and $45,960 will range from $7,650 to over $11,000. The annual savings will slightly increase every year until Medicare kicks in at age 65. That kind of money can buy a lot of gifts for the grandkids. But the grandkids will also face the prospect of seeing their moms and dads divorce because of Obamacare. 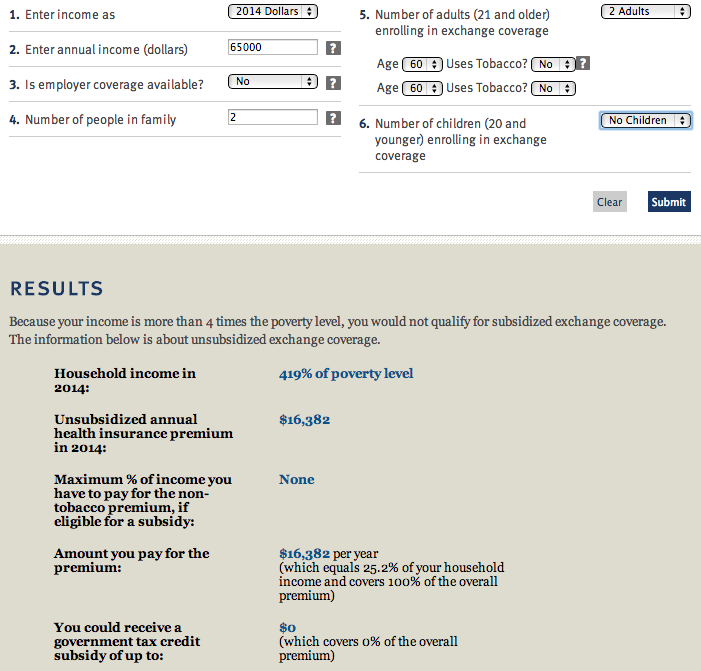 The couple's annual unsubsidized premium while married is $11,547 (OFA's vaunted "tax credits" disappear at $92,401 for married couples with two children). 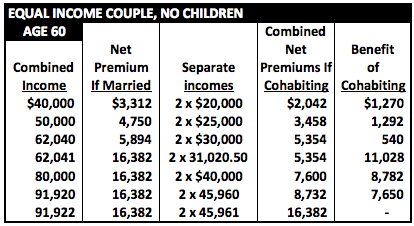 But if they divorce and shack up while giving custody of both children to the lower-earning spouse, their combined annual premiums, at $4,317, will be over $7,200 lower. That's over $600 a month. As was the case in the previous example, the savings from divorce will gradually increase every year. Parents will be torn between doing what Western civilization has considered morally right for millennia and their children's financial well-being as never before.